Despite facing Gibraltar in his first match back in charge, you get the feeling that Mick McCarthy has had Georgia on his mind since the draw was made for the Euro 2020 qualifiers. Ireland play their second game inside four days when they welcome Georgia to the Aviva Stadium tonight in their Group D encounter, having nervously navigated the banana skin fixture in Gibraltar. McCarthy’s men opened with a 1-0 win on Saturday and the new man in charge will be hoping for the perfect start to the campaign, just months after returning for his second stint as Ireland manager. Six points from their opening two games would allow McCarthy to start planning for the trip to Copenhagen in June with real confidence, considering he has only had one week to work with the players. But the significance of tonight’s fixture is far from just being about qualifying for Euro 2020. With the memory of Ireland’s recent matches against Georgia still hurting, whether McCarthy likes it or not, it has become a litmus test of sorts to see whether he can get a better performance from largely the same squad his predecessor had to work with. McCarthy, in the very early stages of his return, and with only one term guaranteed as Ireland manager, will be given a lot of leeway on the style of football, once an attack-minded and passionate performance is on show at Lansdowne Road. On paper, Martin O’Neill’s side fared reasonably well in their four matches against Georgia over the two campaigns, winning three and drawing one. But the performances in the home win and the awful away draw in the last campaign prove memorable, for all the wrong reasons. Fast-paced, attacking football has been promised by the new man in charge, with a real emphasis of getting players forward, and creating chances in and around the penalty box. A high-tempo game should be expected, with maximum pressure put on the opponents, not allowing them to settle, while aiming to get the ball back as quickly as possible. Ireland have rarely performed in that manner in recent years - such performances haven't seen since the Sweden and Italy games, and the first half against France at Euro 2016. So will the new manager achieve it with just a week under his belt working with the new squad? McCarthy gave an insight last week about training drills that get players moving forward in unison, thus getting the midfield up with the play, creating more chances. Jeff Hendrick’s goal in Gibraltar was the perfect example of what the manager is working towards, and perhaps during his time spent looking back on recent Ireland games, he has spotted a real disconnect between defence, midfield and attack, with no-one linking play. Ireland’s defence have been playing so deep – even when the previous manager spoke of playing on the front foot – that they appeared reluctant to move out from the safety of the edge of the penalty box. 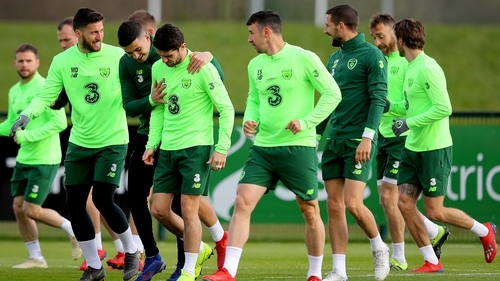 Formation will play a key part in that aspect of the game and by his own admission, Ireland’s two-man midfield endured problems on Saturday night, as the manager was forced to put Harry Arter into the middle of the park, with Gibraltar dominating to a certain extent; Robbie Brady and James McClean not contributing too much from their wider positions. A three-man defence would be a brave move by the manager in his second game in charge, but it would allow him to crowd the midfield, while negating the need for wide midfield players, and the wing-backs taking responsibility for the flanks. Of course, the main benefit of opting for such a set-up would be to allow the manager to play both Seamus Coleman and Matt Doherty in the same XI. This time, of course, it would be Coleman playing slightly out of his comfort zone, playing on the right side of a three-man defence. But surely there would not be too much risk with such a move, playing alongside experienced central players like Shane Duffy, Richard Keogh or John Egan. McCarthy was quick to change things on Saturday night, hauling Doherty off the pitch just 12 minutes into the second half, sending Robbie Brady on in his place. And after the experiment admittedly failed in Gibraltar, perhaps the manager is not willing to take a gamble on another untried situation and would prefer just to leave one of them on the bench. Glenn Whelan was surely brought back into the squad with this match in mind, to perform the sitting role in midfield, but how McCarthy sets up the players around him will be key to how effective the now 35-year-old will be. Working in a three-man midfield would surely allow Whelan to have a bit more breathing space on the ball while dictating play from the back, also freeing him up to take the ball from the centre-halves. Harry Arter and Conor Hourihane, you would imagine, would prove an ideal duo to sit in just in front of the Dubliner. As a result, Jeff Hendrick would be free to play at the top of the midfield or even in the number 10 role, however, it would mean that there would be a lone striker up front. David McGoldrick came out of Saturday’s game as one of the few positives from the performance and was responsible for setting up Hendrick for the only goal of the game. Such a formation would play into McCarthy’s ideology of getting players forward from midfield and with no established goalscorer in the squad, there is no doubt that the entire team are going to have to contribute in that sense. Tonight’s opponents will come to Dublin full of confidence despite getting beaten against an under-strength Swiss team on Saturday. Georgia have got closer and closer in recent years but have yet to beat Ireland, and may have missed their best chance to do so back in Tbilisi the last time the sides met. And in truth, their overall performance at home to Switzerland was not up to the high levels that they showed in matches against Ireland and Wales in the World Cup campaign. They will also be disappointed that they lost their first game of the campaign in a home fixture that could really have laid down a marker for tonight and the remaining Group D matches. The visitors may not be ready for what is expected to be a high-octane opening 20 minutes as McCarthy leads a team out in Dublin for the first time in 17 years. And if they are to have any chance tonight, they will need to negate those opening exchanges and frustrate Ireland by holding onto the ball and slowing the game down, after which they could get their impressive passing game going. But McCarthy knows that if he is going to have a chance to take one of these two available spots next summer, home matches to Georgia must produce three points. The new man is not promising attractive football, but should his side perform the way he thinks that they can, it will certainly prove exciting and will most likely result in a victory, albeit a narrow one.